This versatile coffee cup has the advantages of recycled extraction, heat preservation, portability, and recognition of all k-cup series. 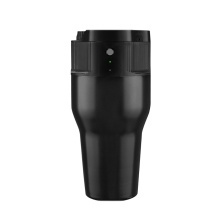 It is a coffee maker for both home and outdoor use. Easy to carry: with leak-proof design, you can store it anywhere without leak, fits in nearly every car drink holder. You can choose the coffee taste freely, the taste of the coffee is mellow and strong. One-button operation, convenient and labor-saving, the concentration can be adjusted. It is a good gift for holiday, lover, colleagues, family, hiker, coffee lovers. Both coffee powder and coffee capsules are available, and the coffee maker fits all capsule cups that can be used in keurig machines.